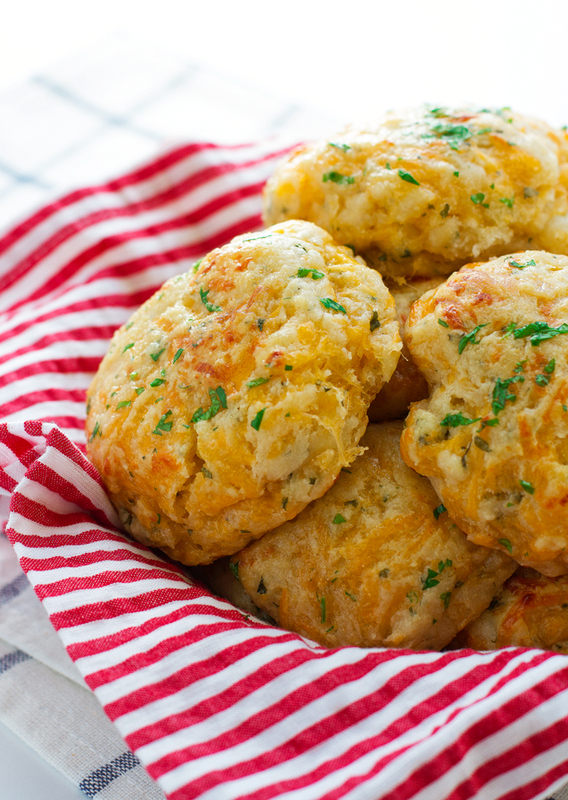 Cheddar Bay Biscuits made with buttermilk and cheddar cheese. Theses biscuits are even better than Red Lobsters version. Brushed with garlic butter when they’re fresh out of the oven, they are just so irresistible! And you don’t even have to go to Red Lobster for them anymore! Ya’ll we’re just over a week away from Thanksgiving! 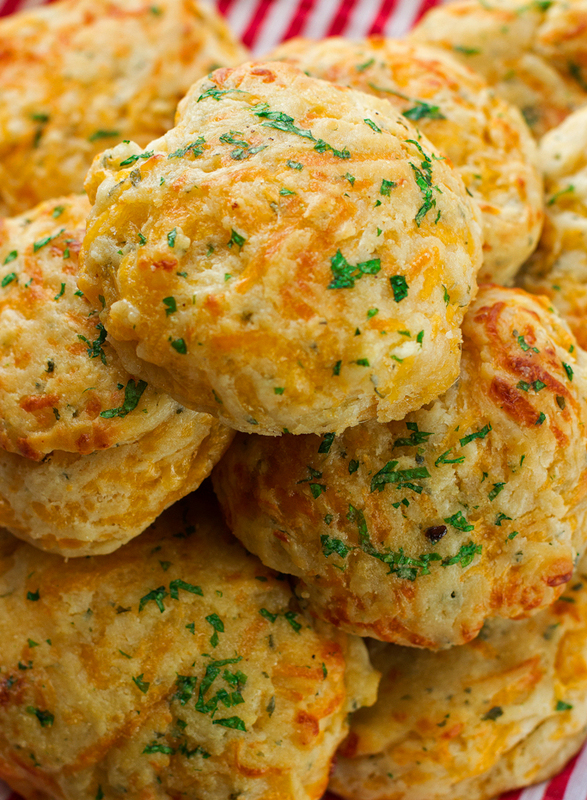 And it’s my responsibility to make sure that you have some deliciously cheesy cheddar bay biscuits for your T-day spread. These are another staple at my Thanksgiving table. I refuse to celebrate without these cheesy biscuits on my table. I mean, if a girl can’t have cheese in her biscuits on the national holiday known for food comas, when can she? I’m very excited about today’s recipe. I think it’s obvious. I’ve been dreaming about these Red Lobster biscuits for the past few weeks now. I wouldn’t allow myself to have them until now because I’ve been known to devour all 12 of them. by. myself. But today i’m bringing these cheesy biscuits to the blog. And don’t worry, I didn’t eat them all. The base for this recipe is my quick and easy homemade baking mix. I used to make these biscuits with Bisquick. That was until I turned over the box and read the ingredients, one fine day. After that, i’ve been making these from scratch. 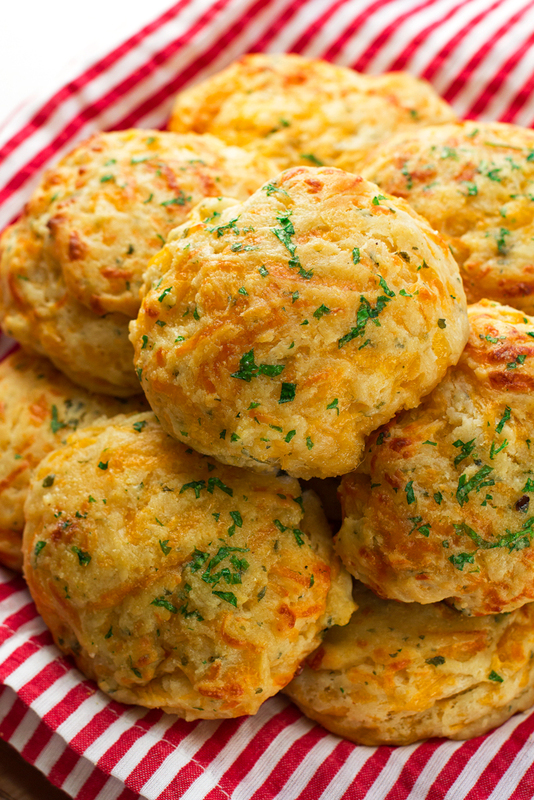 Which takes a total of 30 seconds longer than making these cheddar bay biscuits from Bisquick mix. As a bonafide biscuit love, i’ve tried several recipes and methods for these quick biscuits. Oil or butter? 1 teaspoon of garlic or two? Fresh parsley or dried? I baked these garlicky biscuits at least 10 – 12 times before perfecting the recipe. Today’s cheddar bay biscuits are perfect. And I can say that confidently because i’ve eaten A LOT of them that weren’t. I am going to say that my biscuits are better than Red Lobsters. Without a doubt. All you need is one taste, i’m confident you’ll agree. Let’s discuss a few important ingredients. First – the butter. I’ve made these biscuits with shortening, oil, and butter and the taste of these biscuits/scones was far superior with butter. We’re melting the butter for both the biscuit dough and the brushing on top so no worries about letting it sit out at room temperature for hours. The buttermilk – very important ingrdient here. The buttermilk supplies moisture, as well as leaves the cheddar biscuits crumbs nice and tender. I love using buttermilk in my scones and biscuit recipes because it gives them such a nice homestyle flavor. The powdered milk – yes, you read that right! I used both buttermilk + powdered milk in my biscuit recipe. The powdered milk adds so much flavor to these biscuits, making them so much better than any other recipe out there. I have yet to come across another recipe that uses it. It also gives these biscuits a tender crumb, which is an important factor to these cheesy biscuits and lastly, it gives it a nicely colored crust. The garlic – I use granulated garlic in my biscuit recipe. A full 1/2 tablespoon of garlic powder gives these biscuits the perfect garlic punch that one expects from garlicky cheesy biscuits. 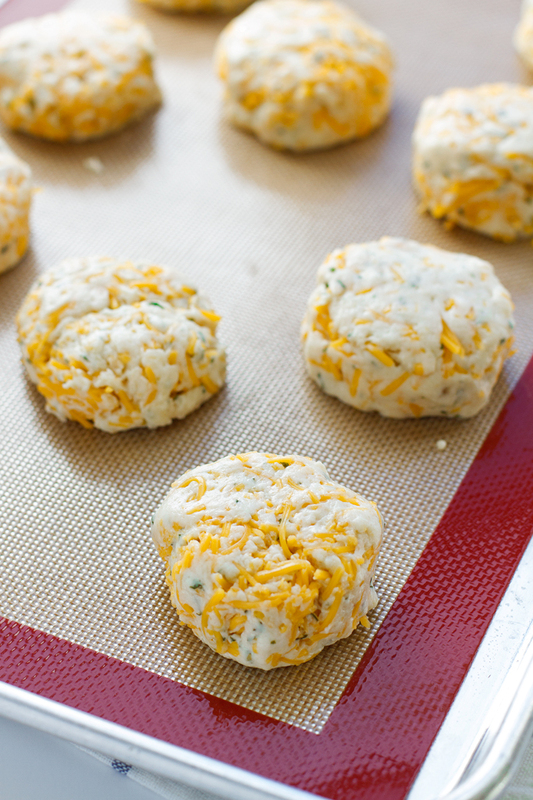 You’ll love the combination of cheese, butter, and garlic in these biscuits! Loaded with cheddar cheese and a garlic punch. There won’t be a single piece of this cheddar bay biscuit left! 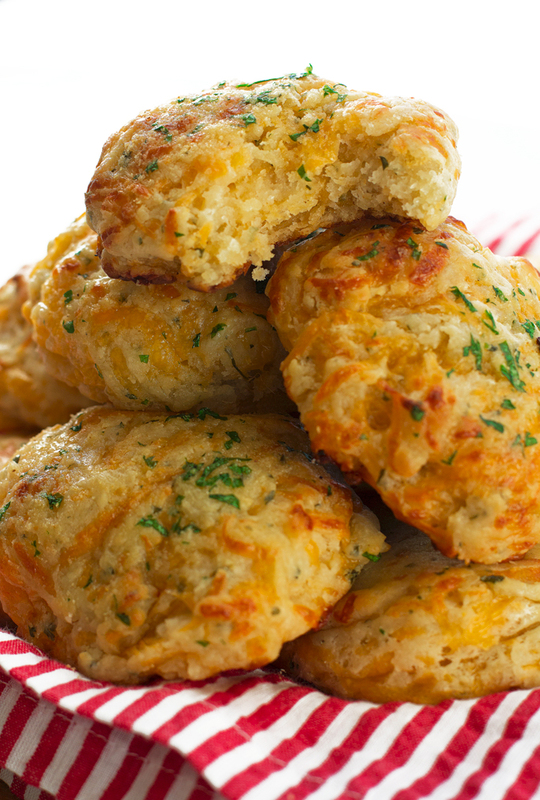 Cheddar Bay Biscuits made with buttermilk and cheddar cheese. These biscuits are even better than Red Lobsters version. Brushed with garlic butter when they’re fresh out of the oven, they are just so irresistible! And you don’t even have to go to Red Lobster for them anymore! Position a rack in the center of the oven and preheat the oven to 450 degrees F. Line a baking sheet with parchment paper or a silicone mat, set aside. Place 1 stick of butter (8 tablespoons) in a small microwave-safe bowl. Microwave the butter until it is completely melted, about 45 seconds, set aside. In a large mixing bowl, combine the flour, salt, granulated sugar, powdered milk, baking powder, 1 1/2 teaspoon garlic powder, and 1 tablespoon parsley flakes. Add the melted butter and the buttermilk into the dry ingredients and using a rubber spatula, fold to combine the ingredients. Add the cheese and fold into the biscuit dough until combined. Drop 2 tablespoons worth of dough that’s been rolled into a uniform shape onto the baking sheet. Bake for 10-12 minutes or until the biscuits are golden brown on the outside. Melt the remaining 1/2 stick of butter (4 tablespoons) in a small microwave-safe bowl, about 30 seconds. Add the remaining 1/2 teaspoon of garlic powder and 1 tablespoon of parsley. Stir with a pastry brush to combine. Remove biscuits from oven when done and immediately brush with melted butter. Serve warm.